The operational and environmental impacts of a conventional and a long-span yarding approach to forest management and its impact on sediment deliveries to stream networks were simulated and compared in T12N/ R14E in the Ahtanum valley west of Yakima, Washington. The conventional approach produced higher revenues at lower costs as expected, but delivered no more sediment to the stream than the long-span, no-new-roads approach. The explanation for this counterintuitive result can be found in the density of the road network and its proximity to the stream. The road network produced a tenfold sediment increase over background levels, which might suggest a programme of elimination and/or surfacing of existing roads. Analysis of this case, however, suggests that the construction of a ridge-based road network will be both environmentally and economically superior. This approach of integrating cumulative environmental impacts into the landscape scale harvest and transportation planning appears promising for identifying management options for reducing salmonid habitat degradation. Forest management in the Pacific Northwest can impact stream habitat in a number of ways (WFPA, 1997). Land sliding can deliver coarse sediments, which fill stream pools necessary for summer rearing habitat. Surface erosion can deliver fine sediments that fill gravels and suffocate incubating fish eggs. Changing runoff patterns can impact water delivery, which can flood and scour downstream reaches. Direct streamside management can impact stream shading and temperature. Streamside management can also remove trees so there are no large logs that can form pools and other structures necessary for stream habitat. One of the common denominators is roads. The Washington Department of Natural Resources (DNR) entered into an agreement with the Federal Government relating to the compliance with the Federal Endangered Species Act (16 US>C> 1531 et seq.). As part of that agreement DNR developed a Habitat Conservation Plan (HCP) which would provide the framework for the management activities of its trust lands (DNR, 1997). Significant changes to timber sales requirements resulted. Rather than commit to a definite, upper limit on road densities, DNR agreed to provide for a comprehensive landscape-based road network management process. The major components of that process includes the minimization of the active road density and a site specific assessment of alternatives to new road construction, such as extending yarding distances and their use where consistent with conservation objectives (DNR, 1997). Impacts on salmonid habitat or water resources in general are influenced by activities in any one of the six general phases of road system development: i) harvest setting planning (yarding distance - road densities/locations); ii) road design; iii) construction; iv) use; v) maintenance; and vi) decommissioning (Everest et al., 1987). The planning aspect includes the trade-off of yarding distance - road densities and within this general framework the location of roads based on the particular topographic and geologic conditions. A clear understanding of a total and true cost accounting of the road transportation system has to include aspects of sediment generation and sediment delivery to the stream network. Current road management strategies in the Pacific Northwest (PNW) and in particular Washington State forests, managed by the DNR are based on average external yarding distances of 360 m (1 200 ft) for cable systems (DNR, 1997). The road manage strategy to be followed under the HCP now requires the inclusion of long-span yarding capacity systems and an aggressive roads decommissioning programme. Of the above-mentioned six phases, harvest setting planning (yarding distance - road densities/locations) and road decommissions may have the potential for significantly reducing overall habitat impact. Current road densities within DNR's nine HCP units in Washington range from 1.05 to 2.05 km per square kilometre (1.69 to 3.29 miles per square mile). However, they are accumulated over large areas, some of which may not be under any management at all. Road densities for watersheds that are based on a comprehensive transportation planning using conventional harvest systems (typical EYD <360 m, 1 200 ft) range from a low of 2.08 to a high of 3.29 km per square kilometre (see Table 1; Schiess, 1993, 1998). The high number is the result of planning in an area with a significant existing road system whereas the other areas were practically unroaded at the beginning of the planning effort (usually < 0.37 km/km2). Another aspect that is important relates to topographic similarities among the planning areas. 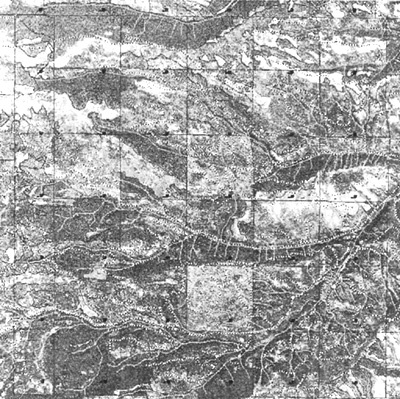 The Siouxon and Washougal planning areas are topographically very similar (South Cascade Range), based on ridge and valley configurations, whereas the Elochoman, Beaver and Heckle Creek are in the Puget Sound foothills. Transportation planning and aggressive decommissioning show potential for significantly reducing road densities in any planning area. Road systems are based on an overall plan and access for management purposes proceeds based on a schedule that balances the various aspects, such as timber flow, maintaining spatial patterns and given serial stage distributions while maximizing revenues. Table 2 shows the increasing road densities as access increases because of increased management. The road spacing is based on an average external yarding distance of 300 m (1 000 ft) or average yarding distance (AYD) of 200 m (670 ft). The variation of the AYD from one period to the next is very small, usually less than 10 percent. At the end of a 25-year period, 27 percent of the area is accessed with a total road density of just over 1.4 km per square kilometre (2 miles of road per square mile of land). This road density does not include any possible road decommissioning. The overall goal as stated in the HCP is to reduce road densities based on the assumptions that this is one of the significant factors that affect salmonid habitat. Road density reduction would be achieved through a combination of increased yarding distances and an aggressive road-decommissioning programme. Both options (increased yarding distance, road decommissioning) have costs associated with them and both strategies will result in decreased road densities. However, as will be shown, neither strategy alone, nor in combination, may reduce the true agent of salmonid habitat degradation: sediment delivery. What is needed is an integrative approach to road system development including new road construction. What is not quite clear are the cumulative effects of either or what a combined strategy has on the natural resources and habitat of sensitive species (Krogstad and Schiess, 2000a). Any comparative analyses should attempt to quantify road use patterns (and with it the economic trade-off) and include sediment budgets as the true agents of salmonid habitat degradation. Sediment eroded from forest roads and delivered to the stream network may impact the habitat of endangered salmon species. This sediment can be estimated for alternate harvest practices using existing models of sediment production and delivery, but our planning objectives and day-to-day decisions must be guided by a simpler measure of road impacts. One convenient measure of the environmental impact of forest roads is road density, defined as the total road length in a landscape divided by the landscape area. A strategy to reduce environmental impacts would presumably include reducing road density, but is this approach valid? As part of a larger study on the economic and environmental costs of road density reduction in a 36 square mile planning area in eastern Washington, a 25 year harvest and transportation plan was constructed using a conventional approach and a road minimizing alternative (see Figure 1). The project was organized along the two activities in order to address the issues mentioned earlier. First, the operational and economic parameters for a harvest and transportation plan comparison of a portion of the Ahtanum watershed were developed. Its purpose was to develop a long-span yarding alternative with the resulting road system and compare the results (revenues and road densities) with the current harvest and transportation plan that had been developed by DNR harvest planners using conventional yarding systems and yarding distances. The second activity centred on developing the resulting sediment budgets for each alternative based on road use pattern and traffic loads (sediment generation and delivery). The original harvest and transportation plan developed by DNR harvest planners was adjusted to reflect the new planning boundaries. However, the stated goals and harvest volume targets were used in the adjusted areas (see Figure 2). The long-span management plan had as its stated goal the reduction of overall road densities. This could be achieved by extending the yarding distances beyond the conventional reach (> 610 m, 2 000 feet) or by not allowing any new road construction. We chose to use both goals. In order to approach the extremes of extending conventional yarding distances beyond 610 m (2 000 feet), we specified that any setting not currently served by an existing road would be harvested by helicopter (see Figure 3). Target volumes for both plans were set at 56 600 m3 (10 MMBF) for the first three periods and then 5 660 m3 (1 MMBF) for periods 4 and 5 as stated in DNR's original base plan. The software used for scheduling and network analysis was SNAP 3.19 (Sessions and Sessions, 1997). Figure 2. Harvest schedules and road use pattern for the conventional plan over five periods (as developed by DNR). Shown are the harvest areas (by period and silvicultural harvest method) and resulting road use pattern. A total of 19.6 km (12.2 miles) of new roads was constructed with 18.5 km (11.5 miles) on DNR land. A total of 1 032 ha (2 551 acres) is scheduled for harvest, of which 823 ha (2 031 acres) are as partial cut and 210 ha (520 acres) as regeneration cut, over a 25-year time span (5 planning periods). The results for the two management plans are shown in Table 3. Neither plan is able to meet the stated harvest volumes without violating any of the adopted HCP or adjacency requirements. Harvest volumes achieved were about 56 600 m3 (10 MBF) over the five periods for both plans. The helicopter use and related harvest patterns reveal some interesting aspects. The conventional plan never used a helicopter despite its potential availability. Targeted volumes could be achieved within the other constraints without resorting to the more expensive yarding method. It was more cost-effective to build additional roads and utilize a larger road system. The conventional plan used a total of 137.6 km (85.5 miles) versus the 83.2 km (51.7 miles) of existing road length in the long-span version. In the long-span plan, helicopters had to be used in order to meet stated harvest goals from areas that were not constrained by other requirements, such as adjacency, seral stage and HCP requirements. As a result, the long-span plan tried to meet stated harvest goals by harvesting more areas in closer proximity to existing roads resorting to smaller tree sizes and lower standing volumes. More mature stands further removed from the existing road network proved economically not viable because of the high yarding costs brought about by long cycle times resulting overall in lower values for the timber harvested. Figure 3. SNAP analysis for the long-span. Shown are the harvest areas (by period and silvicultural harvest method) and resulting road use pattern. Note the absence of any new road construction. A total of 1 035 ha (2 557 acres) are scheduled for harvest, of which 873 ha (2 158 acres) as partial cut and 161 ha (399 acres) as regeneration cut over a 25-year time span (5 planning periods). The study area was divided into a grid, and information relevant to sediment production and delivery (e.g. local slope, distance to stream, road surfacing) was recorded for each cell. The Washington Forest Practices watershed analysis manual (WFPB, 1997) was used as the basis of a Geographic Information System (GIS) programme to estimate sediment production and delivery from each grid cell. Road usage was estimated from the scheduled timber haul estimates (m3/period [MBF/period]). Vegetation on cut and fill slopes was assumed to increase by 1 percent per year, while all existing cut and fill slopes were assumed to be 30 percent vegetated at the start of the simulation. Harvest related soil disturbance was assumed to produce 1 819 tonnes per hectare (810 tons per acre) during the period of harvest. Overland filtering/delivery to streams was estimated by assuming that half the sediment was filtered every 27 m (90 feet). The results of this analysis are summarized in Table 3. Contrary to expectations, the long-span (no-new-roads) option produced more total sediments than the conventional harvest/transportation plan. The no-new-roads option produced less sediment from cut and fill slopes (which is expected because of fewer, that is, no-new-roads), but this reduction was dwarfed by haul related erosion from the tread surface. In the long-span case the scheduling programme routed more of the long-span haul along roads in proximity to the stream network. The resulting increase in total sediment delivery does not represent a failure of the long-span system, but rather that usage of specific roads is far more significant than road density. Table 3. Results from the scheduling and networking analysis for the two management plans. Shown are the harvest systems utilized, road uses and road construction requirements together with costs and revenues. Note that the long-span plan requires no-new-road construction. Minimizing road density did not reduce road sediment because the existing road network (see Figure 4, left) routes most of the haul traffic (see Figure 4, right) onto roads that closely parallel the stream network (see Figure 5). The problem with using road density to describe road impacts is that the vast majority of the road network gets little or no haul, and the vast majority of the haul traffic goes over relatively few road segments. This concentration of haul volume over roads located very close to streams produces the large tread derived sediment load, which in turn dwarfs the sediment produced on all other roads and all other sediment sources in Table 4. Figure 4. The road network covers most of the planning area (left: existing roads are solid, proposed roads are dashed). Most of these roads remain unused in a 25-year harvest plan and most of the haul is carried over a few roads (right: thicker lines represent more haul traffic). Table 4. Sediment delivered to the stream network (tonnes per year [tons per year]) is estimated for each management plan, study period and source area. Concentrating haul onto native surface roads in close proximity to the stream network results in a sediment delivery rate from the road tread that dwarfs all other sources. The utility of road density as a measure of sediment delivery depends on whether sediment is produced by roads or by road use. If we view roads as the source of the sediments, then reducing road density will reduce road sediment. If we view road use as the source of sediments, then reducing road density will not reduce necessary management traffic, or the sediment it produces. The critical question is thus whether road activities (construction and haul) or the roads themselves are the source of sediments (Krogstad and Schiess, 2000b). The study findings (that road density reduction did not reduce the delivered sediments) supports the road use explanation. A traditional programme of road density reduction would eliminate many unused spur roads, which being unused would thus not be the ones producing the sediment. According to the watershed analysis manual, applying a thick gravel to this native surface road network would eliminate 80 percent of the tread sediment production but the remaining 20 percent of the tread related sediment will still approximately double the background sediment. In fact, even if every road in the study area were paved, the cut and fill slopes alone would still provide more than 50 percent of background levels. Disturbance is significant, since forest soils in the Pacific Northwest tend to be protected by a layer of vegetation and litter, and thus produce little surface flow or sediment delivery to streams. Soil disturbances, such as fires or landslides, can expose soils to erosion, but vegetation rapidly covers and eliminates this erosion. Road construction can expose soils to erosion, but these roads will stabilize and revegetate if left undisturbed. Vehicle traffic is thus necessary to maintain active erosion and delivery to streams. Much of this traffic is the result of transportation of logs from their stumps to the mill. If the same logs are to be harvested and transported to the same mills, then haul traffic and traffic related sediment generation would not change by eliminating the first few hundred feet of spur road. A traditional programme of road density reduction identifies and eliminates all road segments that will not be needed in many years. Having no traffic, these roads would have minimal impact on total basin sediments. A traditional programme of road density reduction will thus eliminate roads producing minimal sediment, and retain roads producing most of the road network sediment. An alternative approach to reducing delivered sediment is suggested by Figure 5 in which long linear segments of the study area can be identified that deliver little or no sediment to the road network. A network of primary and secondary roads following this ridge network (and crossing the stream network only rarely) would deliver almost no sediment to the stream network, even if native surfaced. Assuming that rock accounts for half the cost of a new rocked road, then for the same cost as rocking a length of existing road, it is possible to build the same length of ridgeline road, with much less sediment delivery. Road-stream separation is more effective at reducing sediment delivery. While sediment is produced on all forest roads, its delivery to streams is a function of the distance to a stream (see Figure 5). The further that sediment has to flow across the forest floor, the more it can be filtered, and the less likely it is to deliver to the stream network. Roadside ditches and culverts that deliver to stream crossings short-circuit this filtering, therefore, road alignment should avoid streams wherever possible. The ridge network is the topographic opposite of the stream network, never crossing and always maximizing its distance from the stream network. 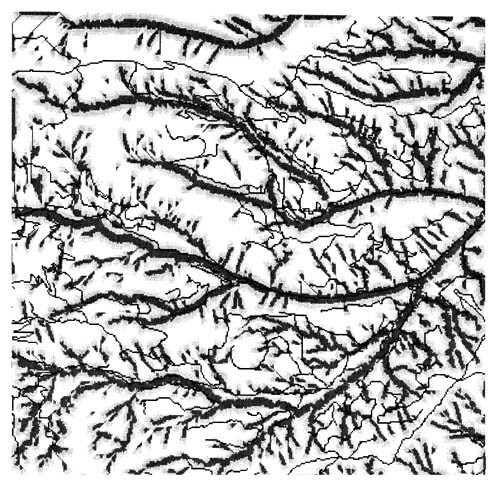 A network of primary and secondary roads following ridge networks (and crossing the stream network only rarely) would deliver minimal sediment to the stream network, even if most of the road is native surfaced. Shifting from a riparian-based road network to a ridge-based road network will entail building more roads, however, and in some cases such a sediment minimizing alignment might even increase road density. Figure 5. Sediment delivery and the existing road network. While areas near streams have near 100 percent delivery (darker areas), a large fraction of the landscape has <0.1 percent delivery (white areas), in which road networks can be constructed that will deliver almost no sediment to the stream network. Examples of such ridge road networks exist in the northwest and southeast portions of the planning area. These results show that sediment budgets and their spatial origins are most critical to effectively address salmonid habitat impacts. As shown here and in the Hoodsport analysis (Schiess, 1999), road density management in isolation is not an effective tool to management impacts. To the contrary, uninformed road decommissioning might result in no improvement at all. Effective management to improve salmonid habitat depends on a clear understanding of the agents of sediment generation and delivery. Both processes are directly linked to transportation issues (both yarding and truck haul) which include the earlier stated six general phases of road system development. Paradoxically as it may sound, new road construction may actually improve salmonid habitat by routing traffic over less sensitive roads. However, such a solution is only possible in the context of comprehensive harvest and transportation planning at the landscape or watershed level, which includes cumulative assessment tools, among them a sediment budget. Everest, F.H., Beschta, R.L., Scrivener, J.C., Koski, K.V., Sedell, J.R. & Cederholm, C.J. 1987. Fine sediment and salmonid production: a paradox. In Salo, E.O., Cundy, T.W. Eds. Streamside Management: Forest and Fishery Interactions. Univ. of Washington Coll. of For. Res. p. 98–142. Krogstad, F. & Schiess, P. 2000a. Haul routing: an overlooked factor in environmentally driven road decommissioning, in Technologies for New Millennium Forestry: Proceedings of the 23rd Annual Meeting of the Council on Forest Engineering., Kelowna, British Columbia. Canada. 11–14 September 2000. Krogstad, F. & Schiess, P. 2000b. Cumulative impact estimation for landscape scale forest planning, In Fourth International Conference on Integrating GIS and Environmental Modeling (GIS/EM4): Problems, Prospects and Research Needs. Banff, Alberta, Canada. 2–8 September 2000. Silen, R. R. & Gratowski, H.J. 1953. An estimate of the amount of road in the staggered-setting system of clear-cutting. U.S. Forest System, PNW Forest & Range Exp. Stat. Res. Note 92,4 pp. Schiess, P. 1998. A watershed management plan for the Washougal watershed. Techn. report, College of Forest Resources, University of Washington. Department of Natural Resources, Engineering Division, Olympia. 148 pp. Schiess, P. 1999. A watershed and transportation plan for the North Hoodsport Block. Techn. Report, College of Forest Resources, University of Washington. Department of Natural Resources, Engineering Division, Olympia. 179 pp. Washington (State) Forest Practices Board. 1997.0 Board manual: standard methodology for conducting watershed analysis under chapter 222–22 WAC, version 4.0, Washington Forest Practices Board, Olympia, Washington. The reported project is supported through funds provided by the Washington State Department of Natural Resources. Conclusions are the authors sole responsibility and do not imply agency approval or endorsement nor do mentioning of brand names.